So on Wednesday 21st August 2013 I went to London. Now even though I live in Britain I don't live really near London, I don't go there very often. So when I do go it's always a privilege. 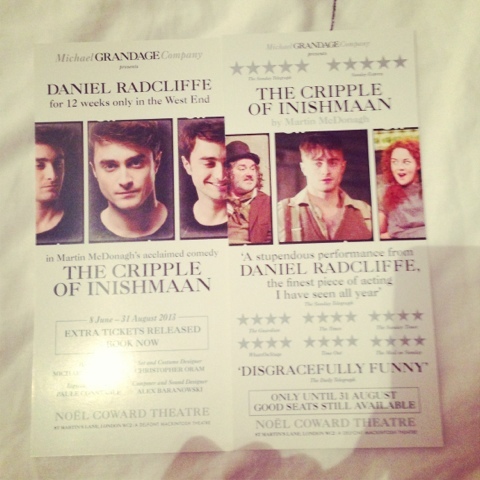 Now before I got the tickets for The Cripple of Inishmaan play I was always intrigued by the title and I was in London for a work experience week in my summer holiday and I kept seeing the play advertised pretty much everywhere I went, plus Daniel Radcliffe was playing the main character so I knew I really wanted to see it. I told my best friend about the play and she really wanted to go and see it as well. Now as the play ends August 31st 2013 we were really lucky and grateful for getting tickets. I thought the price for our tickets was in between expensive and reasonable after seeing the play but I can tell you that I thought the money was worth it. 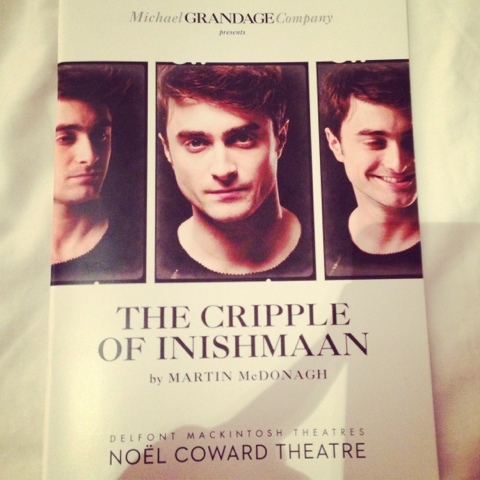 The play was brilliant, Daniel Radcliffe was amazing and the whole cast was great, I highly recommend the play and to go and see it while you still can. If you have seen it what did you think of it? Now unfortunately after the show my best friend and I went to the stage door after the half past two showing of the play which is the one we saw and after it had finished it was about 5:00 so it was two hours with a 15 minute interval. Anyway we were at the stage door along with loads of other fans and a guy came out and said I'm really sorry but Mr. Radcliffe will not be signing anything until the next performance of the show which was later that night at 7:30pm. So it was a real shame that we didn't get to meet him but I'm still very grateful for seeing the play. 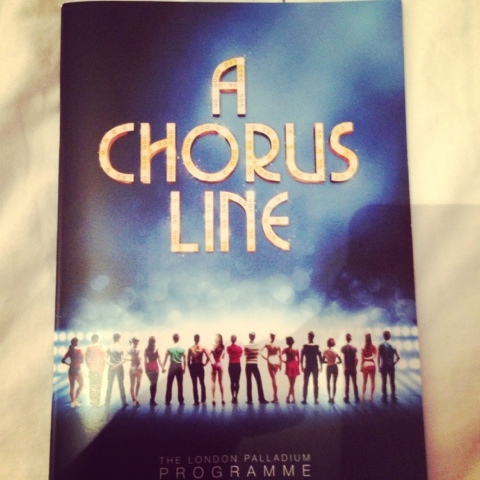 After a lovely meal out with my best friend and some new German friends we all went to see the musical A Chorus Line. My best friend had wanted me to meet her other friends so I did and we surprised them with the show. I highly recommend this play as well if you haven't seen it already. If you have what did you think of it? 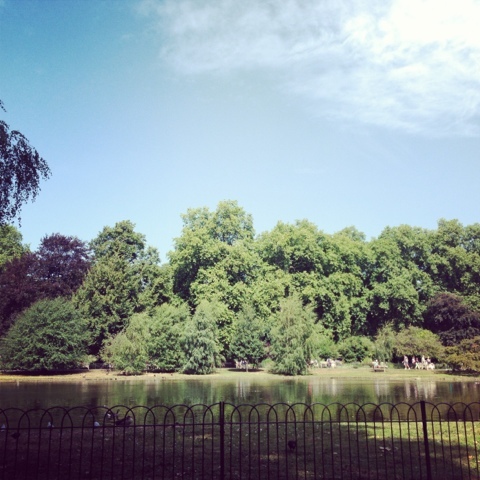 My best friend and I had lunch by the pond in St.James park earlier in the day, lovely view. 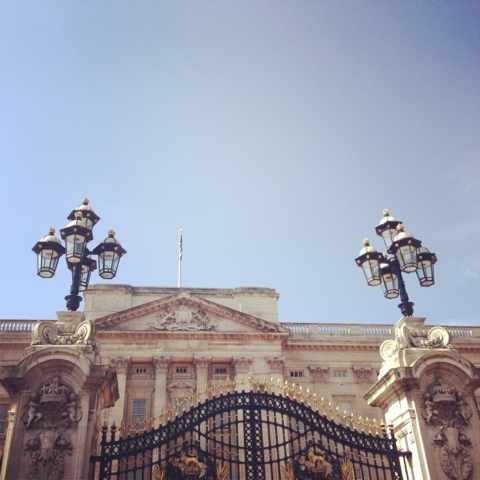 As a final picture of the day I give you Buckingham Palace. 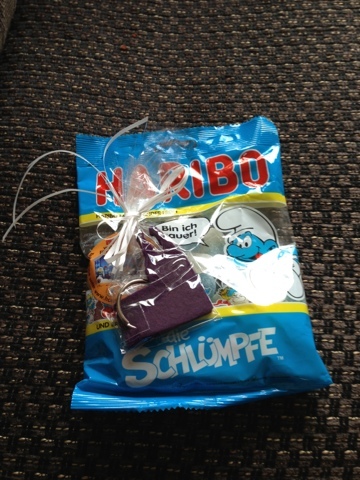 Overall I had a fantastic day with great friends both of the theatres were lovely and I had great food.